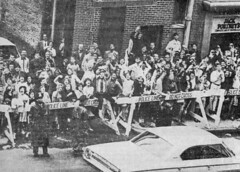 The Beatles’ only visit to Baltimore was on Sunday, September 13, 1964. They performed two shows at the Civic Center, to a total of 28,000 fans. The best seat in the house cost a mere $3.75. The support acts were The Bill Black Combo, The Exciters, Clarence ‘Frogman’ Henry, and Jackie DeShannon. 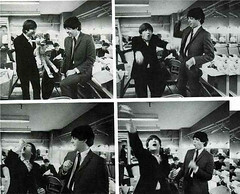 Baltimore was “one of the few fortunate cities” to host The Beatles. 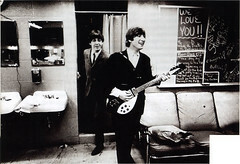 According to the Beatles Bible (http://www.beatlesbible.com), “During the day, two girls attempted to have themselves delivered to the venue in a large box labelled ‘Beatles fan mail’. Their efforts were thwarted by a guard in charge of checking all deliveries. 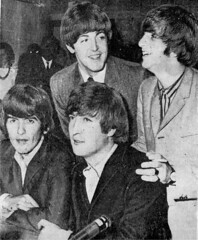 The next day, the Beatles headed north to play at Pittsburgh’s Civic Arena. 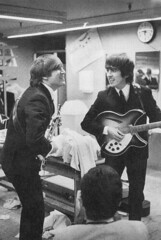 All of the photos below are from The Beatles historic Baltimore visit. 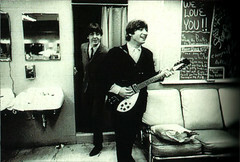 This entry was posted in 1960s, Music and tagged 1964, baltimore, beatles, civic center, holiday inn. Bookmark the permalink. My aunt was at this show. She became so hysterical, she couldn’t speak! 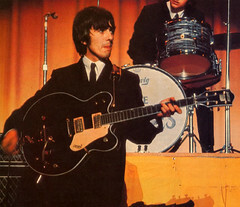 I was at this show in the evening, 8 rows from the front. I could not speak for one week. People were passing out. You could not hear one word sung or spoken but I was there. I was at the second show! I was 14 years old. Sat in the 2nd balcony, 2nd row–great seats, with my girlfriend and her 18 year-old sister who drove us from Virginia to Baltimore that day. I still have the program (that I wrote stuff on) and the ticket stubs taped to the program. 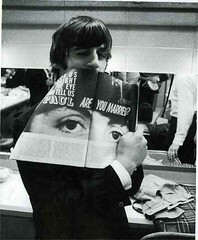 I remember John Lennon joking around. No way you could hear them play. Screaming and hysteria everywhere. Somehow I remember the glass doors at the Civic Center getting broken. What an awesome experience! I was there too. Age 14. 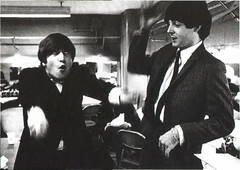 Yeah, Yeah, Yeah! 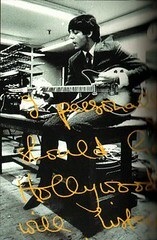 It’s nice to have bragging rights when you are around Beatlemaniacs! I was there. Don’t remember which show, probably the first one. As soon as they came out, everyone stood on their seats and started screaming and it didn’t stop until after they were done, couldn’t hear a thing. No other concert has ever compared to that. I was 13. I was there ,too. 13 years old .My neighbors the LeVantis took me . Nothing but screaming, crying girls and a lot of flash bulbs! When leaving I decided to grow my hair long! I was at the Civic Center at the afternoon show. 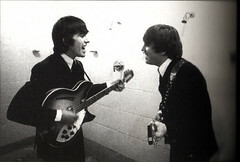 Couldn’t hear a word The Beatles sang. U was to busy screaming & crying George. WJZ was there filming, I was in row AA, well when I got home I watched the news w/my family and low and behold there I am on the news, screaming & crying George. I was there,afternoon show i was sixth or seventh row front. I was seven yrs. old, parents brought us from philly. not positive it was a lifetime ago. remember paul kept moving to left stage talking to somone. also teen girl (braces maybe)right behind me screeming “George” the whole show, (colleen maybe) jackie D. wouldn’t get off, the beatles were gone in a flash!!! best day of my life, never will forget it!!!!!! I was there for the second show. I was twelve at the time and my Dad and Mom had driven my cousin Leilani and two of her friends from Bethesda to see them. Loni was the type of person who always just seem to be placed in your life at those moments when you look back, were the most signifigant and as you might guess, it was her who introduced me to The Beatles music. After checking out the crowd, Dad, to my surprise handed me a ticket. I don’t recall Frogman or Jackie DeShannon too clearly but I do remember that every time Bill Black said the name, Elvis, everyone screamed. My cousin and her friends left me to try and make a rush for the stage. That night was truly a turning point in my life. 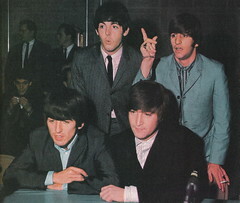 Even though you could barley hear them, after The Beatles took the stage and I saw the crowd reaction, I remember thinking to myself something along the lines of, “Now that’s a good job”. 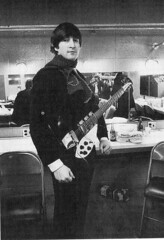 I have been a musician for my entire working life largely due to my experiences that evening. I met Dad and Mom out front after the show and Mom went searching for my cousin and her friends. In her search she actually was next to The Beatles as they were escorted across the street. Mom explained to a police officer what she was doing and he asked her if she wanted to go along with them to find my cousin. I could not believe it when Mom told me that she declined the offer. We found my cousin and her friends. Leilani has since passed away and even though I didn’t actually watch the concert with her I have a special treasure and moment in my life that I will always share with her. I was 11 and at one of these shows with my sisters. All I remember is the pure hysteria of the audience and one detail that’s had me wondering ever since. As we drove away, there was a tall building behind us, and on the roof were the silhouettes of 4 figures just waving to the stream of cars driving away. I’ve always imagined it was the BeaTles. Our local radio station, WGH in Hampton, VA, got a block of tickets that they made available to their listeners at cost: $2.50. I got the maximum, 2 tickets, and a friend of mine and our moms drove to Baltimore for the Sunday afternoon show. Jackie DeShannon was the last act before the Beatles, and I remember how restless the crowd got during her set. 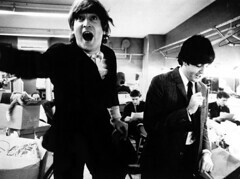 I always thought the Beatles should start their show with A Hard Day’s Night, because of that awesome opening chord, but they had their own order of songs. It was an awesome show, despite the screams. 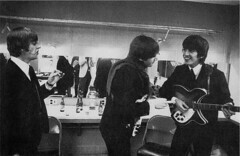 I have always been extremely proud to say I saw the Beatles in concert. Thanks, Mom. 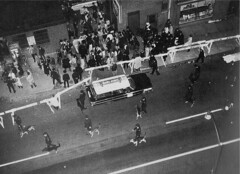 After they dropped us off, our moms went around the back of the Civic Center and saw a lot of commotion with some guys with long hair running from the adjacent Holiday Inn into the building. Wow! Because of the block of seats, we were surrounded by others from the Peninsula/Tidewater area of Virginia, and 2 of my cousins were sitting right behind us. They had driven up the day before and had gotten a room at the Holiday Inn. 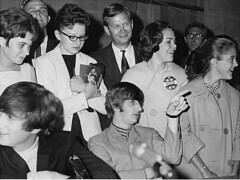 After the show we all went to visit with them – couldn’t even get into the lobby without showing a key – their room was on the floor right below the Beatles. No, guards at the doors prevented anyone from getting onto that floor. 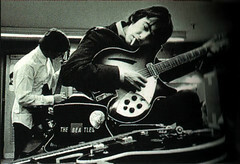 But my cousins said they could hear the Beatles practicing the night before (no, not The Night Before). 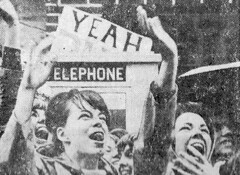 My friend had a Beatles haircut; when he stood at the window facing the front of the hotel we could hear the crowds scream. Before we drove back home, we went to dinner at the revolving restaurant on top of the hotel. This is the same restaurant that Larry Kane wrote about in his book, Ticket To Ride. 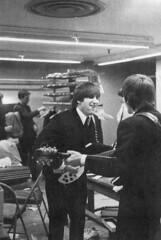 The Beatles reserved it for a late dinner for the entire crew after the last concert. 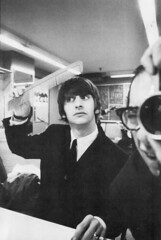 So one of the Beatles may have used the same dinnerware that I had used earlier! 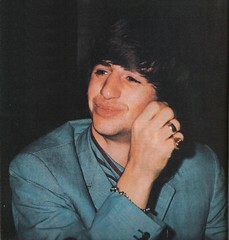 I still have the program and ticket stub (they kept the part that had “The Beatles” on it, so all we got back really was the stub), and a picture of Ringo I bought for $3 because that was all the money I had. I was 14, and this was my first concert. In 2002, when my daughter was 14, I took her to her first concert: Paul McCartney. These are great anecdotes! Thanks everybody for sharing your Beatles experience! My mother Karen Minick was in the fifth row, i have pictures from the show she took. I was there, too! My mom, sister, me and another girl went. I was seven. It was total chaos. I couldn’t HEAR for a week!!! It was so loud. But what a great memory and how much fun is that as a first concert experience. And my mom took me!!! I was a Baltimore City Cop detailed there that night. It was pandemonium there as I remember. We had to use diversionary methods to get them out of the building and over to the holiday inn. I was at this show with a girlfriend. Her dad drove us from Monmouth County, NJ to Baltimore on Saturday night, we stayed at her aunt’s house. Our tickets were for the evening show. It was amazing. We had to go home that night because we had school the next day! Don’t think either one of us could talk for two days! I was there at the first show with 9 of my classmates from Friends School. We were in the first row of non-comped seats. So close we could hear everything. We were the first row to stand up and that made all the rows behind us to stand up. I screamed so loudly that my voice was horse and I could barely hear afterwards. Made it on the news that night and glad my parents didn’t see it. 14 and loving the Beatles. What a great time even though they sang only 20-25 minutes. 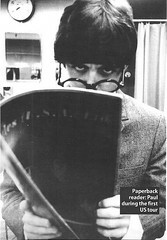 Saw Wings in 1977 or so in Atlanta and then saw Paul just last year 2013. Both of those shows went about 2.5-3 hours. But I loved every minute of the first time. See how old I am ? They opened with Twist and Shout and closed with Long Tall Sally. Ah, I remember it well. and The Layfayettes played “Life’s Too Short”. I was there for the evening show with my friend Paula. I worked across the street for the Credit Burea of Baltimore. I took off from work to get the tickets and was the third person in line. I could only get center court about 6 rows from the stage.. I never notice there were so many younger people then myself and my firend. We were both 18 yrs old. As some had said you had to stand on your seats to see them. I could hardly hear because of all the screaming going on. The show was frantastic…. I went to school with a Nancy Clark. by any chance is she related to you? It was my twin sister and I that took you! I was 13,and saw the day show.Also stood across the street at the Holiday Inn where they stayed.Back then,that was the only “luxery” hotel! Jackie De Shannon sang “What the World Needs Now” and “Shout” before the Beatles came on stage. 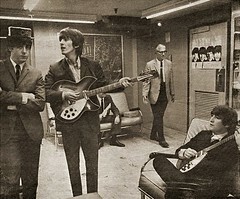 The sound system must have been great, because I could hear her, and the Beatles, over the screaming. Wonderful!!! I was there with my older sister and 2 friends for the evening show. My Dad drove us from Alexandria, VA. I was 14 yrs old. 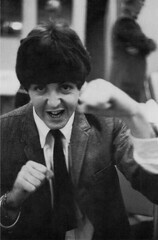 At one point Paul was going to talk and we all got quiet for a second, so I stood up and yelled “Ringo, Ringo I love you” and Ringo held his drum stick and said ” Hi Luv” and the place went wild. I actually went into a trance and all the girls around me were touching me saying “He spoke to you”. It was awesome and I will never forget it. I still have the ticket. I was there for both shows! So lucky! I attended Western High School in downtown Baltimore. The next day a friend of mine came with me down to the Holiday Inn garage. We left school early! We walked into the hotel garage and just hung around for about an hour when we saw their limo coming down through the turns!! We got to see the Beatles !! They waved to us as we frantically ran after the car and waved back! A day I will never forget! We were the only ones there. We just took a lucky guess and thought that’s where they would be staying. It had NOT been made public. I was there for the evening show with a group of friends from Indian Head, Md. We were all between the ages of 13 and 15, so one of the Dads drove us to Baltimore. We were in a balcony, first one up from the floor seats, closest section to the stage, about 10 rows up. Great seats. It was loud of course, but you could hear them over the screaming. There was about a 6 inch gap between the stage floor and the closed curtains and you could see people’s feet walking around backstage. 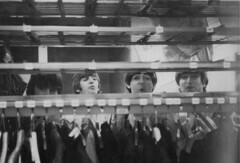 Everytime a pair of Beatle boots walked by, everyone would scream. It was craziness! 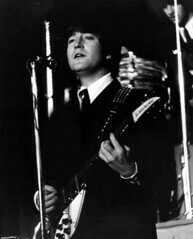 I remember Jackie DeShannon performing, but I do not remember anyone else other than the Beatles. It was fantastic!! Stood outside the civic center after the concert staring up at the Holiday Inn, hoping to get one more glance at them. Best night ever!